There is ample evidence of the connection between witnessing violence in the media and violent and aggressive behavior in games. While most people will not commit violent acts in their lifetimes, we must acknowledge that violent behavior is just a symptom of a deeper problem; aggression is at its root a lack of compassion or empathy for others. Studies have even shown that children raised in an abusive and violent environment not only have impaired empathy and compassion, but the impact is seen on a physiological level within the brain. We adapt to our environment. Whether we internalize this information or not, the media we consume, the computer games we play—all are part of our environment and influence how we view the world and react to it. “You are what you eat.” Surely we have all heard this phrase. Mental diet is just as real as physical diet. What our minds consume make us who we are. Our outlook and worldview are shaped by our “mental diets.” This can include all the forms of media both on and off-screen. Movies, television, computer games, the books we read—all of these “inputs” effect us more than we realize. The drought is hammering the beef industry and driving cattle ranchers out of business; families who have been ranching for generations are selling off their herds. Cattle ranchers were already thinning their herds because of higher corn prices, which increased the cost of feed; grasslands have dried up causing the price of hay to rise 60 percent above the 10-year average. The total number of cattle and calves in the U.S. beginning this year was 89.3 million head, 7.5% lower than at the last cyclical peak in 2007. This is the smallest cattle inventory since 1952. The inventory of all cows and heifers (38.5 million head) that calved in 2012 is 2% less than last year, the lowest January 1 inventory since 1941 (36.8 million head). The beef cow inventory (29.3 million head) is 3% less than 2012. Cattle and calves on feed for slaughter (13.4 million head) are down 5% from last year. The number of calves grazing small grain pasture in Kansas, Oklahoma and Texas (1.34 million head) is 16% lower than last year. The worst drought since the 1930s continues. Its latest casualty is one of the largest beef processing plants in the country: Cargill’s Plainview (Tex.) facility, which handled about 4 percent of all the cattle slaughtered in the America. 2,000 workers there will lose their jobs at the Texas plant. 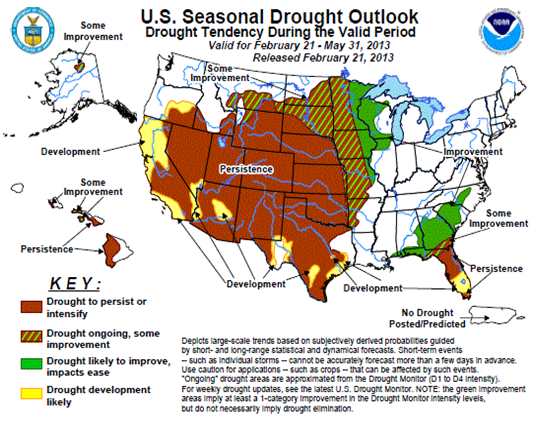 A recent three-month outlook by the National Weather Service’s Climate Prediction Center forecasts that the drought will persist across the Plains and spread across most of Texas in 2013. Make sure to read Leviticus 26, a chapter that explicitly instructs us how to receive the blessing of regular rain, and good crop yields. “If ye walk in my statutes, and keep my commandments, and do them; Then I will give you rain in due season, and the land shall yield her increase, and the trees of the field shall yield their fruit. And your threshing shall reach unto the vintage, and the vintage shall reach unto the sowing time: and ye shall eat your bread to the full …” (verses 3-5). National obedience to God’s laws is the key to a healthy economy and productive farming. The solution to drought is national obedience to the Ten Commandments. We wait to see if the mid-west gets the rain it desperately needs. We will be keeping a close watch on the spring rains of [April, May & June]. Will The Next Pope Be European? There is growing pressure within the Catholic Church to elect a non-European Pope, something that has not happened for more than 1500 years. European cardinals now make up 52 percent of the Conclave [Catholic Church summit to elect the next Pope]. Philip Jenkins, a professor of history at Baylor says, “One figure I find very powerful is that by 2030, there will be more Catholics in Africa than in Europe”. Latin America, meanwhile, has 41 per cent of the world’s Catholics, yet Latin Americans claim only 19 Cardinals. Brazil is the largest Catholic country in the world, and Mexico is the second largest. Nearly three-quarters of Latin Americans identify as Catholic, only a quarter of Europeans do. The chances are still slim that the successor to Pope Benedict will come from Latin America or Africa. Such a change would mean a major power shift in the direction of third world countries—something many European Cardinals do not want to see take place. Many believe Canadian Cardinal Marc Quellet may be the best choice. He is well-known in European circles, he speaks five languages, he also spent time in Colombia [Latin American nation]; and would make the ideal compromise candidate as both third world and European cardinals respect him. Revelation 13:11-14 describe a “beast” who looks like a lamb but speaks like a dragon, one who will perform stunning signs. We believe this is a reference to a future charismatic, religious leader who will sway much of the world to his way of thinking. But this man will be strongly influenced by Satan himself. We believe this man will be the leader of the Roman Catholic Church [a leader who is alive when Christ returns]. The office of Pope is still highly respected in political circles. We watch carefully to see who the next Pope is and what his agenda will be. North Korea has carried out its third, most powerful nuclear test despite UN warnings, and said “even stronger” action might follow. It described the test as a “self-defensive measure” necessitated by the “continued hostility” of the US. Its main ally, China, criticized the test, which was condemned worldwide. Nuclear test monitors in Vienna say the underground explosion had double the force of the 2009 test, despite reportedly involving a smaller device. If, as North Korea reports, a smaller device was tested successfully, analysts say this could take Pyongyang closer to building a warhead small enough to arm a missile. The UN Security Council will meet at 14:00 GMT to discuss the test and its ramifications, diplomats say. All we know at the moment about the North Korean test is gleaned from seismic data: the event was magnitude 4.9, significantly larger than the 2006 and 2009 tests. North Korea announced last month that it would conduct a third nuclear test following those in 2006 and 2009 as a response to UN sanctions that were expanded after the secretive communist state’s December rocket launch, a move condemned by the UN as a banned test of missile technology. 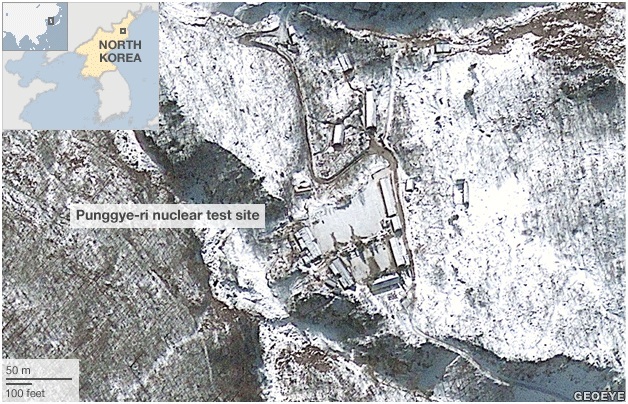 Activity had been observed at the Punggye-ri nuclear test site for several months. Seismic activity was then detected by monitoring agencies from several nations at 11:57 (02:57 GMT) on Tuesday. A shallow earthquake with a magnitude of 4.9 was recorded, the US Geological Survey said. North Korea said the nuclear test – which comes just before US President Barack Obama’s State of the Union address – was a response to the “reckless hostility of the United States”. “The latest nuclear test was only the first action, with which we exercised as much self-restraint as possible,” the foreign ministry said in a statement. The Vienna-based Comprehensive Nuclear-Test-Ban Treaty Organization said the “explosion-like event” was twice as big as the 2009 test, which was in turn bigger than that in 2006. It is the first such test under new leader Kim Jong-un, who took over the leadership after his father Kim Jong-il died in December 2011. UN Secretary General Ban Ki-moon condemned the test as a “clear and grave violation” of UN resolutions and a “deeply destabilizing” provocation. Mr Obama said the test was a “highly provocative act”, and called for “swift” and “credible” international action in response. China expressed “firm opposition” to its ally’s test, urging the North to honor its commitment to denuclearization and “not take any actions which might worsen the situation”. Pope Benedict XVI announced Monday that he will retire citing age and declining health becoming the first pope in 600 years to resign from the office. “Before Easter (March 31), we will have the new pope,” Federico Lombardi, a Vatican spokesman, said at a news conference. The last pope to resign was Pope Gregory XII, who stepped down in 1415. There are 118 electors eligible to vote for the Pope’s successor according to USA Today. Italy has the most cardinal-electors at 28, and the United States follows with 11. There are 61 Europeans, 19 Latin Americans, 14 North Americans, 11 Africans, 11 Asians and one from Oceania among the voters. Benedict XVI will not participate in the conclave. Cardinal Angelo Scola, Archbishop of Milan, is a favored Italian who would bring Benedict’s enthusiasm for “recapturing Catholic excitement in Europe.” He is a top scholar on Islam and the Christian-Muslim dialog, Scola is 70. He is popular among Cardinals. Cardinal Marc Ouellet of Canada, 68. One of the most powerful men in the Vatican [he is prefect of the Congregation for Bishops], Ouellet spent many years living and teaching in Colombia which makes him an attractive person to Latin American Catholics. He is intelligent and multilingual– One of the top 3 favorites. Cardinal Peter Kodwo Appiah Turkson of Ghana, 64. He is the head of the Council for Justice and Peace and former Archbishop of the Cape Coast. Turkson speaks his native Ghanaian language, Fante, as well as English, French, Italian, German and Hebrew, as well as understanding Latin and Greek. Cardinal Turkson likes to be able to joke with people in their own languages. Cardinal Angelo Bagnasco, Archbishop of Genoa, 69 years of age. He speaks multiple languages, and is decisive on Doctrinal issues. He is two-time president of the Italian bishops conference. Italians hold about a fourth of the seats in the College of Cardinals that will elect the next pope. Why should you be concerned as to who becomes the next Pope? Because we believe the Bible makes clear that a future European dictator will seek to secure the backing of Rome [see Revelation 13 & 17]. Popes have played a pivotal role in world history. European history reveals that Papal Rome played a pivotal role in backing secular governments in their attempts to create a unified “Catholic” Europe. This “unholy” alliance is viewed by God as an act of promiscuity—a type of Spiritual fornication. The Catholic Church is described as ”MYSTERY, BABYLON THE GREAT, THE MOTHER OF HARLOTS AND OF THE ABOMINATIONS OF THE EARTH” [Revelation 17:5]. Revelation speaks to just how influential the Catholic Church has been: An angel had explained to John that “the waters which you saw, where the harlot sits, are peoples, multitudes, nations, and tongues [languages]” (verse 15). No other Church in history has exercised so much power! Rome is of course, known throughout the world as “the City of Seven Hills”. This fallen woman who sits on “seven hills” (verse 9) is the great false church whose headquarters is in Rome, Italy—none other than the Church of Rome. European leaders such as the Emperor Justinian, Charlemagne, Otto the Great, Charles V, Napoleon, Benito Mussolini and Adolf Hitler all tried to revive the Roman Empire in various forms under their leadership. These dictators formed agreements with Rome hoping to profit from the approval of the Catholic Church. The beasts described in Daniel 7 and Revelation 13 were not ridden by the woman. The Beast of Revelation 17 is. In Revelation 17, the ten horns represent ten future rulers who will collectively give their power and authority to “the Beast”—an end-time revival of the old Holy Roman Empire. The time setting is yet ahead of us because these ten will fight against Christ at His return (Revelation 17:12–14, 17). Watching the Vatican [Roman Catholic Church Headquarters] is important. Too many people underestimate the political power of the Roman Catholic Church.